Cornerstone Mennonite Church, located near Memphis, Missouri, USA, began 24 March 2001 as a Biblical Mennonite Alliance (BMA) church. The only minister of the church was killed in an accident in September 2004, leaving the church without leadership. The group asked Mid-Atlantic Mennonite Fellowship (MAMF) for help. Luke Martin was commissioned to serve as bishop in October 2006, officially making Cornerstone a MAMF church. Services were held in a small church on 17th Street in the little town of Downing, Missouri. In June 2008, Lynn Horst from the Sharon congregation in Lebanon County, Pennsylvania, moved to Missouri to serve as minister. The building in Downing became too small so a new church was built six miles (10 km) west of Memphis, in Scotland County, Missouri. 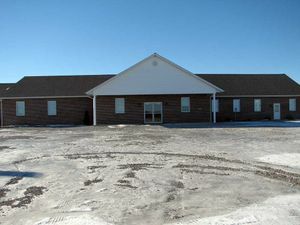 The first service was held at the new location on 5 April 2009. On 4 October 2009, Clifford Martin was ordained as deacon. In 2013 the ministerial team consisted of Luke Martin, bishop (of Lancaster County, Pennsylvania); Lynn Horst, minister; Clifford Martin, deacon. As of 1 January 2013, membership at Cornerstone was 48 with an average attendance in the 80s. Direction from Keokuk: Take Route 136 West to Memphis. Go approximately six miles (10 km) and turn left on Dover Church Road. The church is on the right. Stauffer, Romaine. "Cornerstone Mennonite Church (Memphis, Missouri, USA)." Global Anabaptist Mennonite Encyclopedia Online. April 2014. Web. 25 Apr 2019. http://gameo.org/index.php?title=Cornerstone_Mennonite_Church_(Memphis,_Missouri,_USA)&oldid=126838. Stauffer, Romaine. (April 2014). Cornerstone Mennonite Church (Memphis, Missouri, USA). Global Anabaptist Mennonite Encyclopedia Online. Retrieved 25 April 2019, from http://gameo.org/index.php?title=Cornerstone_Mennonite_Church_(Memphis,_Missouri,_USA)&oldid=126838. This page was last modified on 7 November 2014, at 16:27.